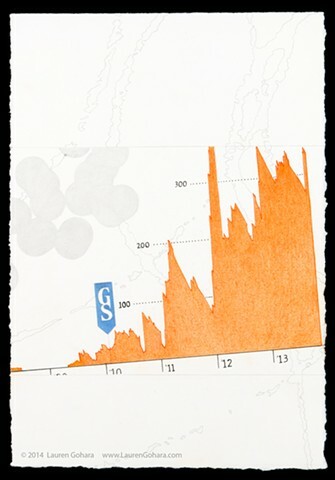 A sharply rising orange graph dominates. It chronicles the rising time it takes for companies to obtain aluminum stored in Goldman Sachs-owned warehouses since GS purchased the warehouses in 2010. The wait time has risen more than 6-fold, to more than 300 business days. A cluster of dots rendered in graphite appears to approach the graph. Particle physics tracks drop through the background.